July 31, 2017 ― The 40th Coca-Cola Suzuka 8 Hours Endurance Road Race got underway on July 30, 2017 at the iconic Suzuka Circuit in Mie Prefecture, Japan, and saw the Yamaha Factory Racing Team’s Katsuyuki Nakasuga, Alex Lowes and Michael van der Mark stretch Yamaha’s string of wins from 2015 and 2016 at the prestigious event with another. 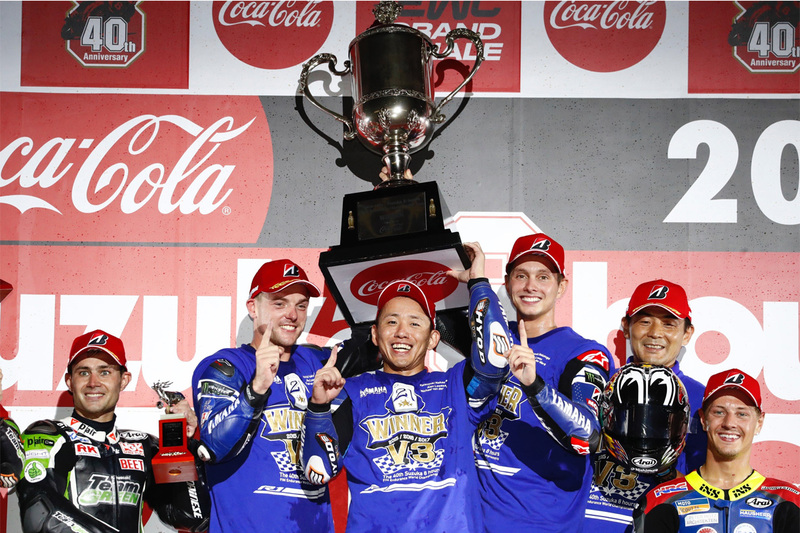 This marks Yamaha’s first-ever third consecutive Suzuka 8 Hours win and the seventh in the company’s history. After claiming pole position in the Top 10 Trial the day before, lead rider Katsuyuki Nakasuga was initially swallowed by the lead pack into turn one as the race got underway, but quickly began fighting his way back to the front to sit just behind the #634 bike going into the second lap. Never more than 0.1 or 0.2 seconds behind, the hunt ran on until lap 16 when the local hero took the lead briefly before hitting heavy traffic with backmarkers and some light rain on parts of the track. From then on, the trio were never troubled by the competition, keeping up their dominant weekend-long pace and building up to a lap clear of the rest of the pack by the end of the race. Lowes took the honor of the last hour’s ride, slightly calmer than his previous stint that saw him break the race record not once, but twice. First smashing the standing 2’07.943 with a 2’07.402, then later delivering an unbelievable 2’06.932 lap. The factory YZF-R1 crossed the line in 1st to the delight of the thousands of Japanese race fans present, writing a historic page in the endurance racing book as the second consecutive triple race win by one team in the history of the race. Nakasuga added to the honors by becoming the first Japanese rider to ever win the Suzuka 8 Hours three times in a row. The YART Yamaha Official EWC Team have consistently remained the top performers outside of the top five teams this weekend, and today’s race proved no exception. Broc Parkes was the first man on track, initially dropping to 9th in the first hour. Nozane then took over, and from there the team took turns to fight back, upping the pace until they were able to hold 5th position. A last minute technical issue with a chain adjuster cost a place but Nozane was able to bring it back to 5th for the final run home, earning YART 3rd in the series standings. The GMT94 Yamaha Official EWC Team also competing full-time in the Endurance World Championship overcame a 30-second stop-and-go penalty late in the race to finish in 11th and clinch the EWC title, adding a third to the French team’s crowns from 2004 and 2014.